Classic speed in an FC! What do you do with a racing pedigree engine when you’re no longer in the sport? Sitting it in the corner is a sin and selling it is bad economics! 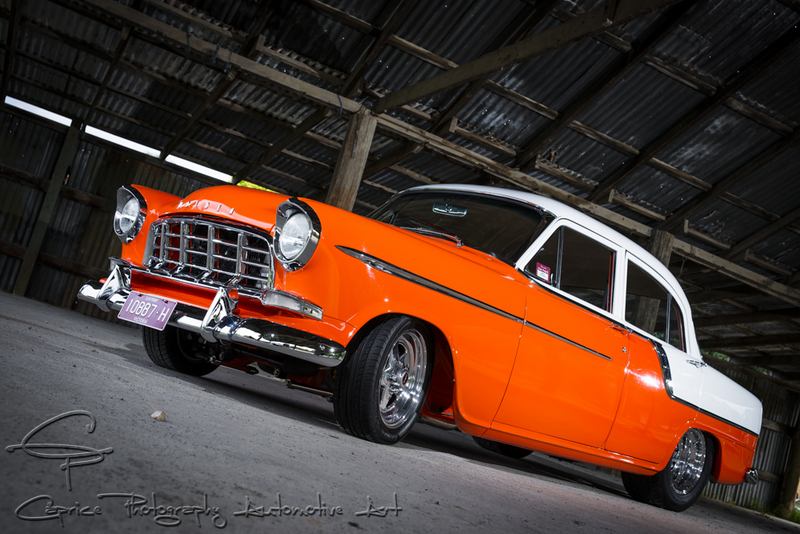 Well Dave Graham’s solution was to shoe horn his 350 Chev into his favourite classic ride, an FC Holden Special. The problem is though, that these match ups are like putting a square bung in a round hole, it won’t just happen! Dave Used to race speedway 20 years ago when he was a much younger man but these days he’s more content to cruise around in a tough street car for entertainment. 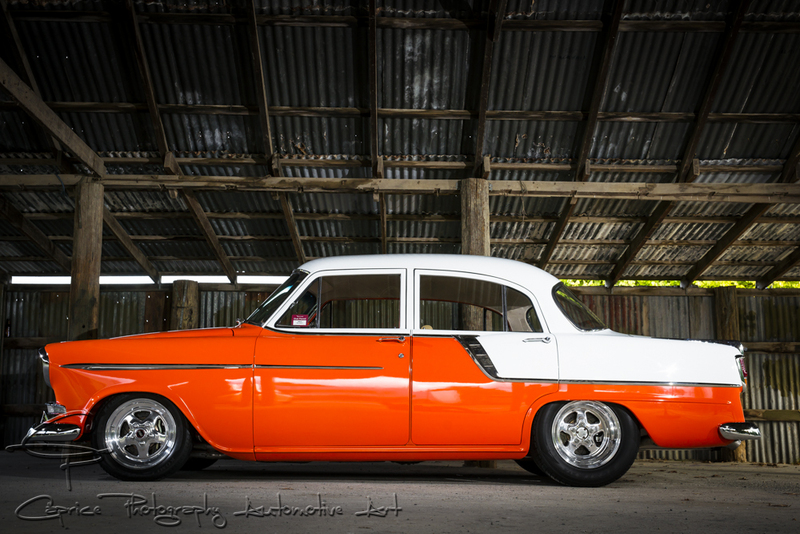 As previously mentioned, Dave’s choice of street car is an FC and loves the flowing lines of the classic Holden. “I had an FC previously, about 15 years ago but it was someone else’s build and everyone used to say to me, that’s so-n-so’s car and it used to annoy me so I decided to build my own.” The running gear in this car was out of his speedway machine and he wasn’t about to part with that so he ripped it all out and sold the rolling body. He hunted around and found himself a ride to call his own, complete with grey motor and all. The floors were gone and had rust in the usual places but the vision was there. “I started the build in 2000 and finished it in 2010. It spent time at various places, a mate had it for 5 years working on the custom sheet metal part time from home. He’s a coach builder by trade and constructed it all in his garage with a lump of wood and a couple of bits of pipe. He hand finished all the flooring and tubs and spent three weekends just fabricating the custom inner guards. He also mounted the commodore hinges so they lay nice and flat and recessed into the firewall. “Makes for a neater appearance with the bonnet off.” The firewall was tidied up by relocating the wiper motor, creating a neat symmetrical appearance in the engine bay. 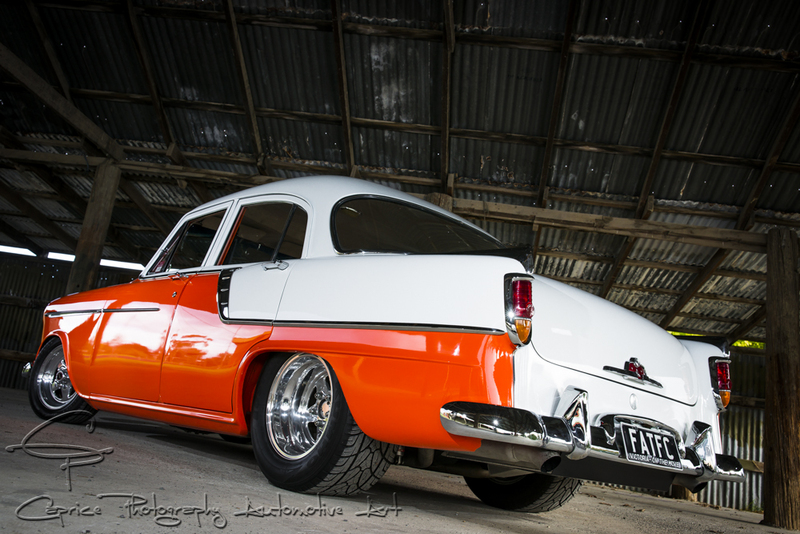 The rest of the bodywork was completed by the boys at Harvey body and customs which Dave co-owns. 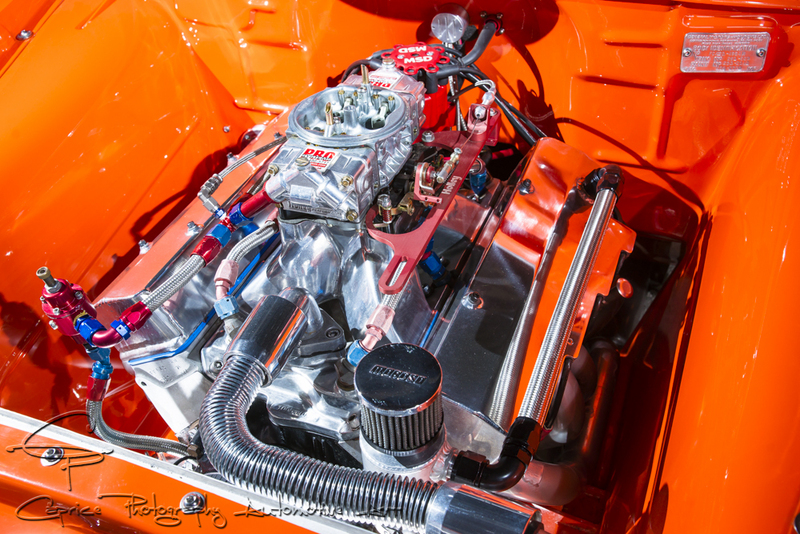 The engine itself is a healthy 600 hp, 350 Chev with alloy NASCAR heads and huge cam. The 5500 converter in the Powerglide auto is testimonial to the size of the lift on this lumpy stick! “When it’s on the street and you stall it up to 4,500 rpm, it just breaks traction straight away!” Exclaims Dave. 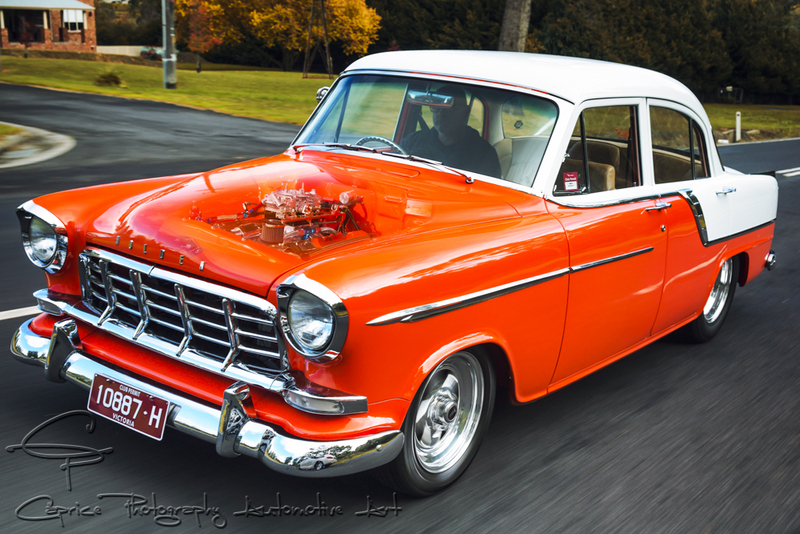 “I ran it once at Heathcote with the standard street tires on and it ran 11.04 secs @ 128 mph. 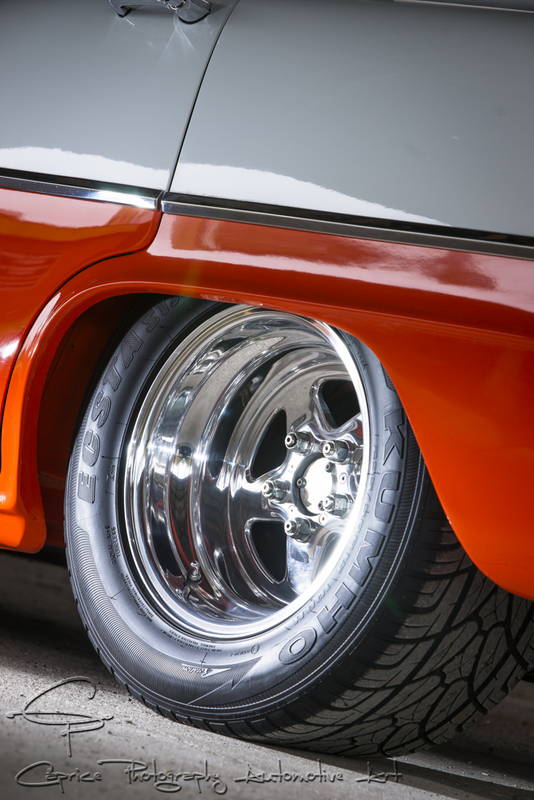 With the right tires, it should run mid 10s with the mph and horsepower it has”. Down back is an adjustable 4 link mated to a sheet metal 9 inch. 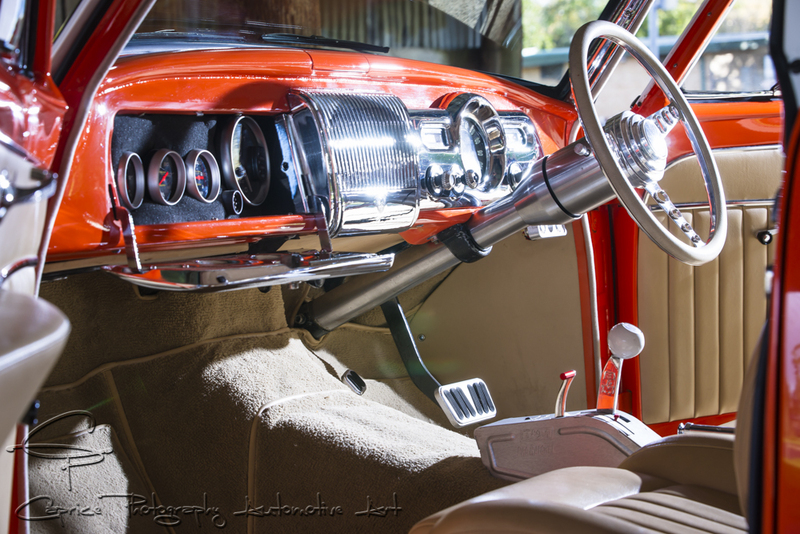 A Rodtech front end, similar to what’s found in a 1934 Ford hotrod takes care of all the steering and suspension duties. 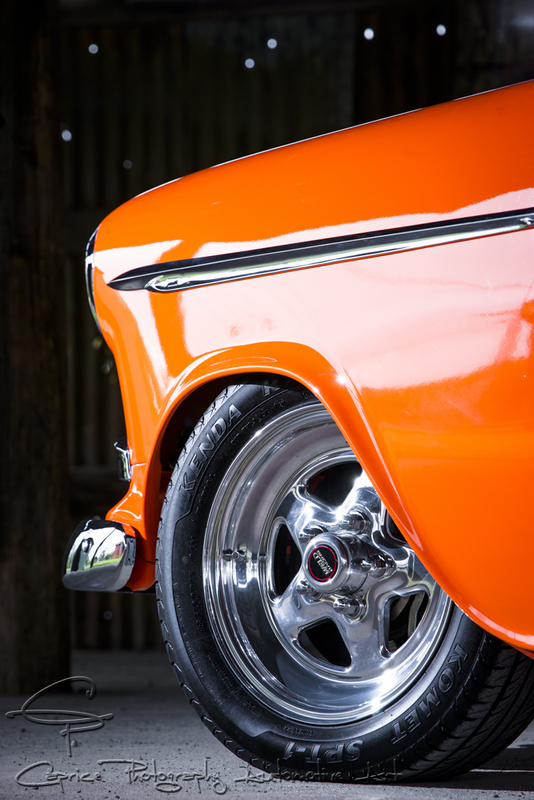 10 X 15 Prostar rims with classic street/ strip rubber fill the tubbed rear guards while 15 X 6s suit the front. She might be all race pedigree underneath but Dave still likes his creature comforts when it comes to cruising. Front seats are Toyota supra without the headrests with the rear seat left standard. Original door trims finished in pleated leather. The floor tunnel has been lifted about 3 ½ inches to house the Glide while adding strength to the floor. To maintain a clean look throughout the interior Dave hid essential gauges in the glove box while an amplifier and Sub-woofer are mounted under seat and speakers under the dash. Plug in an Ipod and you’ve got tunes! 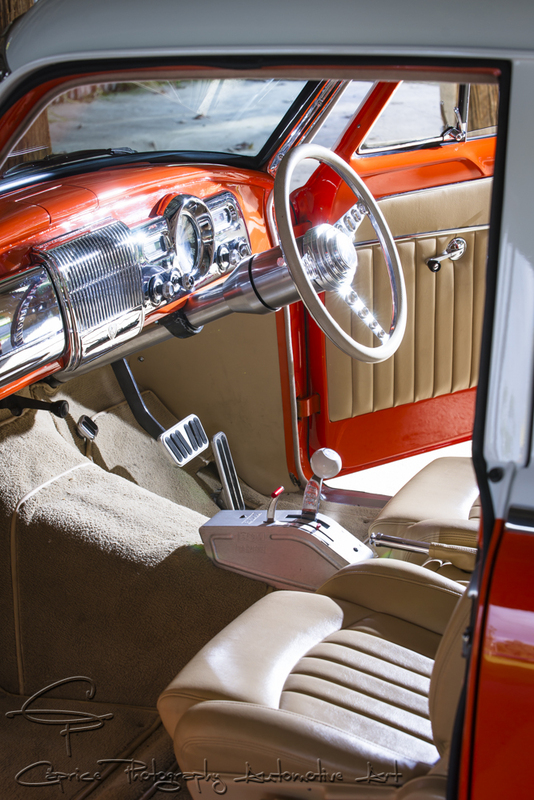 A Billet Specialties steering column and wheel finish complete the image. Dave would have preferred a column shifter instead of the floor shifter but it just wasn’t going to work with this style of driveline. The boot compliments the interior while hiding the battery. A DIY wiring loom and heavy power cable with large 4WD battery ensures there’s no starting issues. The paint scheme was always going to be two tone according to Dave but what colours? “The body was ready to paint, we sat down, decided orange and white will do. Picked the colours and away we went.” They settled on Lamborghini Orange and white. Fast car, fast paint! This one’s a keeper in Dave’s eyes. “Too much heart and soul has gone in it to sell it. I’ve been offered stupid money for it and been told I’m stupid not to sell it for that price. I’ve got it the way I want it and it’s a one off. No one else can build it exactly the same.” There’s plans for an engine change later in the year upping the HP to a massive 700! “I’ve gotten used to the current 600hp” claims Dave. How about waiting for the rest of us to catch up!